Acer expanded its popular Switch 2-in-1 notebook line with two new models – the Switch 5 and Switch 3 – featuring Windows 10, with versatile, highly-mobile designs for work, school and fun. Both new Acer Switch 2-in-1 notebooks can be used with an Acer Active Pen on the touch screen to sketch, take notes or annotate documents or photos with Windows Ink. The Acer Switch 5 builds on the industry-leading innovations of its predecessor, the Acer Switch Alpha 12, providing a fanless, quiet experience through Acer LiquidLoop™ cooling, and excellent performance with up to 7th Generation Intel®Core™ i7 processors. 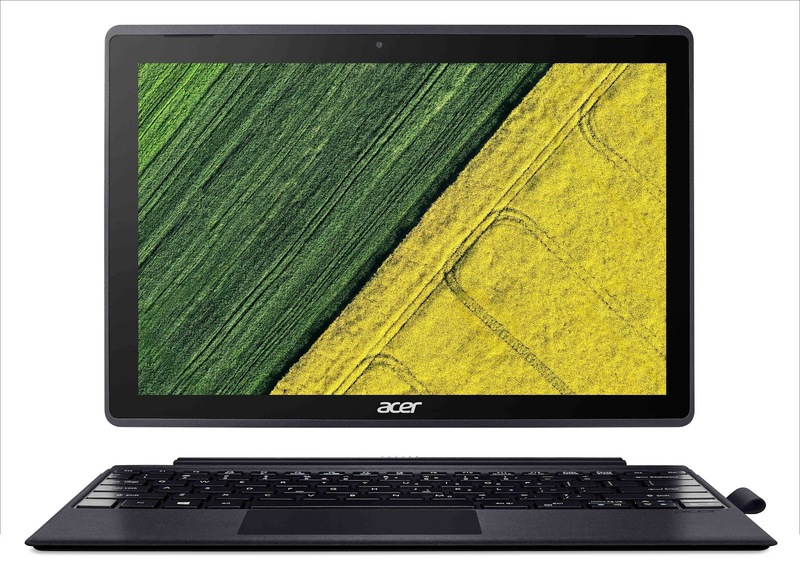 Acer’s patented auto-retracting kickstand allows for easy one-handed adjustments to the viewing angle. It also supports Windows Hello with a fingerprint reader for fast and secure access. The Acer Switch 3 features a 2-in-1 design that is well-balanced with a large 12.2-inch display, Intel processors and a quiet, fanless design. The Switch 5 is Acer’s first 2-in-1 to be offered with 7th Generation Intel® Core® i7 and i5 processors to deliver the top-rated performance needed for serious tasks, presentations and entertainment on the go. The built-in fingerprint reader on the power button authenticates users and provides quick access to their projects. Users can be assured their information will remain secure and private when using the fingerprint reader for logging on thanks to Windows Hello. With Acer’s patented auto-retracting kickstand, the Switch 5’s viewing angle can be easily adjusted one-handedly, providing added convenience in any scenario. Also, the Switch 5 uses Acer’s proprietary fanless LiquidLoop™ cooling system to keep it running efficiently without fan noise, making it ideal for shared spaces such as meetings and open offices. Plus, the LiquidLoop Cooling System doesn’t require venting that can compromise reliability due to airflow issues and dust accumulation. The fanless design supports powerful 7th Generation Intel Core processors to deliver excellent performance and day-to-night 10.5-hour battery life. The Switch 5 has a vibrant 12-inch wide-view FHD+ touch display with IPS technology, an impressive 2160 x 1440 resolution and support from Intel HD Graphics 620. Customers will enjoy vivid colour and crisp detail on the display for video and fun that can be shared on wide 178-degree viewing angles. Acer TrueHarmony™ and Smart Amplifier provide enhanced audio performance for clarity and robust volume to complement the exceptional display. The Switch 5 has an anodized aluminum chassis that is elegant and modern. The brushed hairline texture complements the design while enhancing the comfort of the device during transport. The Switch 3 brings excellent usability and performance to students, families and anyone looking for an excellent all-around value. The device runs on Intel® Pentium® and Celeron® processors that deliver solid every day performance and up to 8 hours of battery life. The 12.2-inch display is designed to deliver incredible precision and a responsive 10-point touch experience. It has a wide 178-degree viewing angle and 1920x1200 FHD resolution with IPS technology. The front-facing speakers complement the stunning visuals with enhanced volume and quality for rich, expressive tones. The sleek metallic top cover has a distinctive yet subtle design with complementary etched edging. The Acer Switch 3 has won a Red Dot Award: Product Design 2017, one of the most prestigious product design awards. Both the Acer Switch 5 and Acer Switch 3 come with an attachable keyboard that snaps on with ultra-secure magnets and can be adjusted to an ergonomic angle for customer preference. The Switch 5’s keyboard is backlit for added convenience while working in darker environments. Measuring just 5.85 mm thin, the keyboard delivers 1.4 mm of travel to ensure comfort and productivity while typing. Plus, the keyboard protects the screen and ensures easy transport. The large trackpad supports convenient and intuitive navigation with Precision Touchpads supporting Windows 10 gestures to provide a smooth and responsive experience. The versatile and stable U-shaped kickstand holds up the display and can be adjusted fluidly to any angle up to 165 degrees. The anti-slip design holds the display upright when customers touch or write on the display. Plus, the Switch 5 can be adjusted effortlessly with a single hand thanks to the auto-retracting kickstand. Both systems work with the Acer Active Pen, which enables accurate and detailed direct-to-screen digital ink input for a natural pen-on-paper experience that’s perfect for notetaking, sketching and capturing ideas and taking advantage of Windows Ink. The Acer Active Pen provides palm rejection and 1024 levels of pressure sensitivity. Both the Switch 5 and Switch 3 have front and rear cameras for videoconferencing and capturing memories. Both systems’ front webcams provide 720p Full HD video recording. For commercial customers, the Acer Switch 5 can be purchased with the Acer USB Type-C Dock that transforms the device into a powerful workstation. This compact dock enables high-speed video, audio and data transfer and keeps the work area clutter-free with immediate connectivity to an additional display and other devices. It includes the ports and connections commercial customers need: DisplayPort, HDMI, two USB 3.1 Type-C ports and three USB Type-A ports, as well as audio input for microphone and audio output for speakers. The Switch 5 and Switch 3 are available with ample storage and memory options. The Switch 5 supports a 256GB or 512GB PCIe SSD and up to 8GB of LPDDR3 SDRAM. The Switch 3 supports 32GB, 64GB or 128GB eMMC memory and up to 4GB of LPDDR3 SDRAM. Both models can access additional files through the MicroSDXC slot. The devices both feature a thin and reversible USB 3.1 Type-C port for fast data transfers of up to 5Gbps from connected peripherals, to share video and also to power other devices. Both lines also have an additional USB 3.1 Type-A port and Bluetooth 4.0. 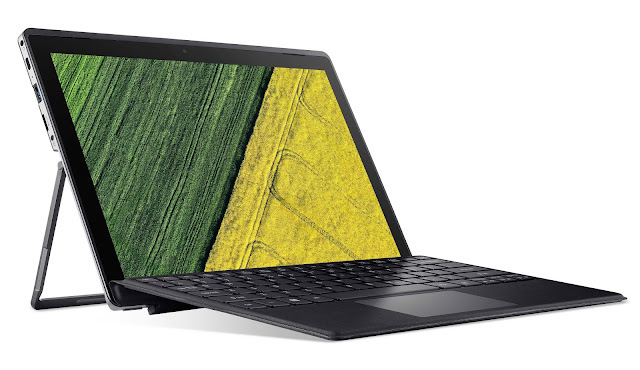 The Acer Switch 5 is thin and light, measuring just 292 (W) x 201.8 (D) x 12 (H) mm (11.5 x 7.94 x 0.47 inches) and weighing 1.27 kg (2.8 pounds) when the tablet and keyboard are connected. The Switch 5 tablet alone measures just 9.6 mm (0.38 inches) in height, and weighs 0.92 kg (2.03 pounds). The Switch 3 measures just 295 (W) x 201 (D) x 16.3 (H) mm (11.61 x 7.91 x 0.64 inches) and weighs 0.9 kg (1.98 pounds) when the tablet and keyboard are connected. The Switch 3 tablet alone measures just 9.95 mm (0.39 inches) in height, and weighs 0.9 kg (1.98 pounds). The Acer Switch 5 will be available in South Africa in July from R 6 999. The Acer Switch 3 will be available in South Africa from July, at an RRP of R12 999. Checkout more at www.acer.com. The new Acer Switch 5 and Switch 3 were unveiled recently at the next@acer press event held in New York. For more information, visit www.acer.com/nextatacer.